OUR FULL BARE ROOT RANGE IS NOW AVAILABLE! This year, as always, we have a wide selection of bare root options to choose from, offering exceptional value – particularly for those looking to plant in large numbers, to create a hedge or group of trees while dormancy dominates… and before ‘growing power’ is revived in the garden once more, next spring. As one of the few things that is good to plant as temperatures plummet and ‘growing power’ dwindles in the garden, bare root also gives you the most from every penny spent! Bare root single whips and pots of 10s are available in a number of varieties. From Birch to Beech, Poplar to Privet, there’s a new growing project waiting to be taken on, at a very affordable price! A frustrating time in the garden? Bored during the cold, dark winter days? Bare root can cure your boredom! For planting when there’s little else to plant. Variety is the spice of life and you’ll almost certainly find a greater range of bare root options to choose from, than pot grown equivalents. Many bare root options simply aren’t available to buy in any other form. Save your muscles a workout as you move and transport bare root plants with ease. Space savers and weight savers, bare root certainly is the ‘no hassle’ option. You may think a container grown plant would stand a better chance of taking off more quickly than its bare root equivalent, when in fact the opposite is true. The roots don’t have to make the transition from container soil to local soil with the bare root version. (Note, this is why all of our plants are potted into soil based compost – makes for a much smoother transition). Being planted in dormancy, they also have the advantage of several weeks root growth before their container counterparts are planted in spring. Go on…give bare root a go! See below for a full list of this year’s stock… but please check availability before making a special trip, if you’re after something specific! Primocane and Floricane raspberry canes are available in pots of five, at the unchanged price of £7.95 this year. There are a number of different varieties available. Floricane or summer fruiting raspberries, produce flowers and fruit on the second year’s/last year’s growth, while Primocanes produce fruit later, in the autumn, on the current season’s growth. 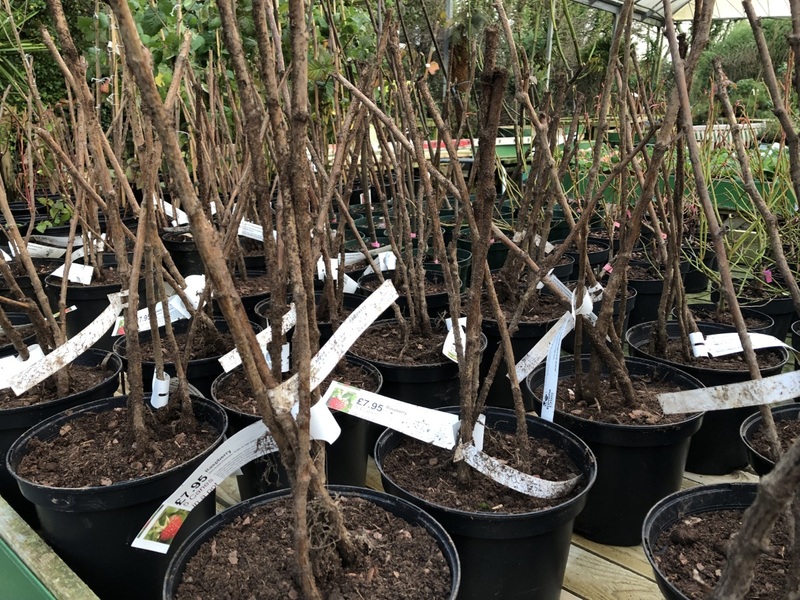 Planting out a combination of different floricane and primocane raspberries can give you a long crop of delicious raspberries, staggered over the entire fruiting season!